The Evening Read: Slow Printer? Fighting with a slow printer? Here's some item to check that may improve your performance. Are you running the latest driver from the manufacturer? If your PDF files are getting mangled or crashing your application, are you using a PostScript driver or PCL? Try a different flavor. 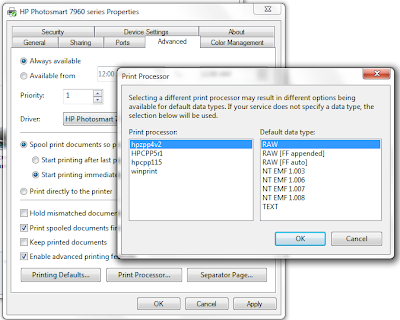 Does your printer have expandable memory? You can consider adding memory, or using a front-end server for ripping. But, make certain your driver is configured to use the full memory of your device, or that your spooling options at the driver level rip appropriately for your configuration. A new technique I discovered is the importance of the print processor. Buried deep within the driver's Advanced settings, you'll find the Print Processor selection as show in the screenshot below. I've recently had a driver default to the winprint. This slowed ripping significantly. Switching to one of the native HP based items improved rip speed significantly. Your mileage may vary.